Ron Jacobs passed away on the eve of Christmas, 13 years after he suffered a massive stroke while forming the Philippine team set to compete in the 2002 Asian Games in Busan, South Korea. RON Jacobs, the legendary coach who ushered a new era in Philippine basketball in the 80s, died on Thursday night, just a few hours before Christmas. Veteran columnist and broadcaster Quinito Henson, a close friend of the American mentor who served as national team coach from 1981 to 1986, posted on his Twitter account news of Jacobs’ passing in Makati at 8:30 p.m.
“Yes, it is sad,” said TNT coach Jong Uichico, the longtime lieutenant and protégée of Jacobs, in a text message to Spin.ph in confirming the sad news. “Rest in peace,” said former player and now Adamson coach Franz Pumaren, who played under Jacobs for the national team as chief back up to starting point guard Hector Calma. Barangay Ginebra deputy coach Olsen Racela also paid tribute to the man responsible for transforming him to a star point guard the moment he suited up for San Miguel Beer with Jacobs as coach. “RIP Coach Ron Jacobs. You were more than just a coach to all of your players,” said Racela in his twitter account@thebigOls. Jacobs would have turned 73 on Dec. 27. Until his death, Jacobs, the great former Loyola Marymount coach, has long been bed-ridden following a massive stroke he suffered while preparing the Philippine team to the 2002 Asian Games in Busan, South Korea. Uichico took over the coaching job from Jacobs and almost steered the team to the gold medal match if not for Korean assassin Lee Sang Min’s game-winning three-pointer in the semifinals that denied the Philippines a shot for the championship against Yao Ming and mighty China. 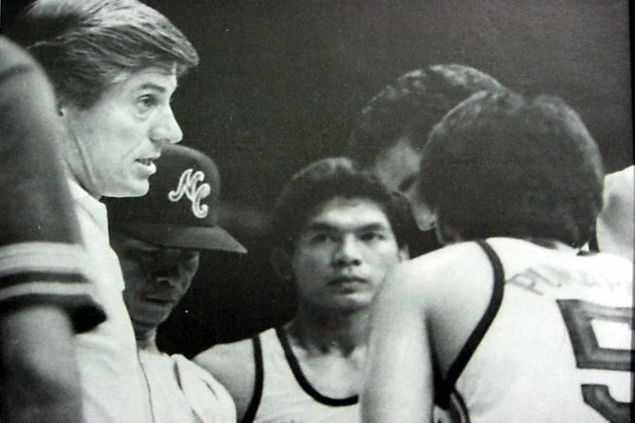 Jacobs’ brilliant handling of Loyola Marymount’s basketball program in 1980, paved the way for then Philippine project director for basketball Ambassador Eduardo ‘Danding’ Cojuangco to tap him as head coach of the national team in 1981 under the banner of Northern Consolidated Corp or NCC. He first won his title as national coach during the 1981 Jones Cup when he steered an American-laden PH team to the championship. But it was in 1982 when Jacobs really began to etch his name in Philippine basketball after steering a team bannered by Calma and the late Alfie Almario to the championship by stunning fancied China in the finals held at the Araneta Coliseum. His legend even grew after the NCC squad, now with the likes of Allan Caidic and Samboy Lim, along with naturalized players Dennis Still, Jeff Moore, and Chip Engelland donning the national jersey, beat a US side bannered by NCAA Division 1 players, for the 1985 Jones Cup crown. A few months later came Jacobs’ crowning glory as the Philippines regained the crown in the Asian Basketball Confederation (ABC) Championship (now FIBA-Asia) in Kuala Lumpur, Malaysia – marking the last time the country would win the biennial meet. A product of University of Southern California, Jacobs won’t chart his career in the PBA until 1997 when he took over from Norman Black as San Miguel Beer coach. Unlike in 1985 when he led the talented NCC squad to the Reinforced Conference crown with a 4-0 sweep of Manila Beer to become the first and only amateur team to emerge champion in Asia’s first ever play-for-pay league, Jacobs has to rebuild a moribund Beermen side anchored on the scoring explosion of Nelson Asaytono and Racela’s effective playmaking. In just a season with the franchise, Jacobs went to guide the Beermen to two third place finishes. A year after, he eventually passed the San Miguel coaching reins to Uichico after he was relegated to a consultancy job following the petition made by the Basketball Coaches Association of the Philippines (BCAP) before the Department of Labor and Employment that he’s not eligible to coach in the PBA being a foreigner.